Todai-ji is a Buddhist temple complex, that was once one of the powerful Seven Great Temples, located in the city of Nara, Japan. Its Great Buddha Hall, houses the world's largest bronze statue of the Buddha Vairocana, known in Japanese simply as Daibutsu. 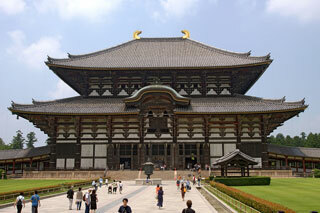 The temple also serves as the Japanese headquarters of the Kegon school of Buddhism. This article uses material from the Wikipedia article "Todai-ji", which is released under the Creative Commons Attribution-Share-Alike 3.0 License.